Ordinarily, I would like to have a weaving post about now. Since I usually have several different fiber projects going on at once (one for weaving, one for knitting, one for spinning, and whatever else I happen to be working on at the time) I find I can rotate topics and post every 2 - 3 days. However, things aren't all that ordinary around our house these days. Due to non-technical difficulties, I have barely gotten my new warp threaded, let alone done any weaving. For spinning, I have a nice little pile of Galway Cross rolags ready to spin. And for knitting, I've picked up my handspun samoyed lace scarf again. Thanks to the knitting expertise of my friends Lacy Mary and M, I've been able to pick up where I left off without difficulty. I have to say that it's been hard to get much work done these days. There are two cats thundering up and down the hallway with great vigor and speed several times a day. Usually I have to wait until everyone is catnapping. Then I can proceed with some peace and quiet. A more eventful report should follow in a day or two......I hope. Jazzy, our tortoise shell cat arrived on the scene almost 2 years ago. With her arrival, I permanently lost my after dinner knitting in the evening. She whines and cries for me to get down her 'cat dancer' or her shoe strings to play with her once we've cleaned up after dinner. If you have better luck in reclaiming your time & space, let me know how you did it. Oh gosh, I know all about scheduled kitty play time, lol. Valerie, maybe what you need is another cat. True, you have to put up with tearing races thundering up and down the hallway, but after they wear one another out, then it's blissfully quiet! Catzee sent me. I should tell my friend Jen about you...she likes to knit. Did you spin your bunny fur? I never had angoras. But my two shorthair rabbits sure make a lot of fluff! It's proabably spinable...just get all the hay out of it. Hi Renee! Thanks for the visit. So nice of Catzee to send you my way. Yes, I do spin my angora. It makes lovely yarn. I haven't tried shorthair rabbit down, but I have spun cat! OH I love CATS. Life is not complete with out a GOOD CAT. I just got a dog Border Collie, (not a hyper one) and my cat was a major influance on my decision. What you need is my cat. She DOES NOT play with yarn or fibre. Ever! I can make a warp, dress the loom, wind bobbins, knit crochet, spin, whatever, and all she does is WATCH. 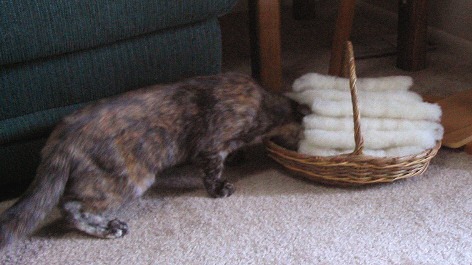 Occasionally she will sniff at the cone while I am winding a bobbin, but that is it.